One of the major challenges for pharmaceutical executives is focused on leveraging manufacturing and packaging processes to reduce costs by optimizing the flexibility and capacity of existing machining resources, while at the same time maintaining the safety and sterility standards needed to mitigate risk across the supply chain for both prescription (Rx) and over-the-counter (OTC) products. Protecting the contents of pharmaceutical products is a critical objective for pharmaceutical producers. The industry is infused with a strong quality-control emphasis, such that raw materials, in-process fillers and packaging systems, and finished products are continually checked for product integrity. The processing, packaging and distribution needs for pharmaceutical products can be quite demanding. Most pharmaceutical products must be produced, stored, filled, sealed, packaged and transported under conditions that ensure product integrity and maintain safety. The systems for handling many pharmaceutical products, through every part of the supply chain from manufacturing to shipping, must be done under compliance with FDA regulations. Some of these products are controlled substances requiring strict handling under FDA and DEA compliance. Others are aseptic, or refrigerated or frozen, and need to be handled in temperature-controlled environments, or require a combination of special handling activities. Such constraints are endemic to pharmaceutical manufacturing, filling, packaging and distribution cycles. One area of critical importance for maintaining product safety and packaging integrity as these Rx and OTC products are moved throughout the supply chain is shrink wrapping. Not only can shrink wrapping keep these products clean and dry, but it can also add a measure of tamper resistance. Shrink wrapping of pharmaceutical products has seen significant improvements in automation over the past decade, commensurate with increases in computing capability of PLC controls, improved performance of servo-driven motors, and streamlined high-speed camera technology. Combined, these have enabled precise product and film control, which allows high-speed wrapping with precision print registration. The result is fast, reliable and flexible shrink wrapping, with minimal moving parts, reduced maintenance, and maximum uptime performance, while using the least amount of film possible. Pharmaceutical manufacturers need equipment that is compact, efficient, capable of running both bottles and cartons with minimal changeover, and that provides real-time data capture of SKU lot codes for FDA-mandated track and trace requirements of product movement across the supply chain. The latest shrink wrappers fulfill these requirements, which are designed to fit a wide variety of pharmaceutical applications. Side-seal shrink wrappers are generally considered the most flexible of the various wrapper styles, and are often chosen by pharmaceutical contract packagers who have the need to wrap a never-ending variety of packages. These wrappers encapsulate products in a continuous tube of film, sealing along one side of the package and then separating the packages into individual units downstream using a cross-seal. Side-seal machines can run random products of infinite length. Side-seal wrappers come in two basic configurations: two-belt and three-belt. Two-belt sealers are made more compact by eliminating one of the infeed belts and making the end-seal prior to the side seal. Two-belt units are often the logical choice when pharmaceutical manufacturers find themselves needing the ability to wrap longer products without greatly expanding the length of production lines. Three-belt side-sealers have the added advantage of being able to precisely space the products prior to entering the wrapping area. Side-sealers function in one of two throughput modes: Intermittent-motion or continuous-motion. With intermittent-motion sealers, the end-seal carriage remains stationary and does not move with the product. This necessitates stopping the product stream momentarily as each seal is made. In a dual side-seal design, the end seal is made prior to the side seal. This design allows the system to fit in a smaller space, but also requires the product to be spaced apart prior to entering the infeed conveyor. With continuous-motion wrappers the incoming stream of products does not stop while the end-seal is being made, thereby increasing throughput speed. Continuous-motion side sealers are ideal for pharmaceutical shrink wrapping applications that demand high throughput speeds with maximum package flexibility. Lap-seal wrappers place a nearly invisible overlap seal under the package, making a very attractive package, while using the minimum width film. Lap-sealers use flat or single-wound film, which is pulled over a forming plow, overlapped under the package and sealed by use of either a static or thermal seal. As the products flow through the former, they are encapsulated in a continuous tube of film and cut apart downstream by the end- seal device. Lap-sealers are most popular in pharmaceutical applications which call for long runs of constant-sized products, because each product requires an individually-sized plow and a specific width of film to be stocked. 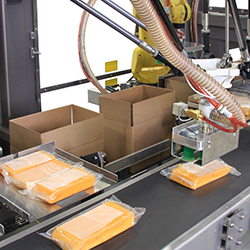 High-speed lap-sealers can reach throughput rates of 250 packages per minute. L-bar shrink wrappers are named for the L-shaped seal configuration which simultaneously makes the end- and side-seals of one package, as well as the front-seal of the trailing package. Generally chosen for pharmaceutical applications where speeds are slow to moderate—up to 50 packages per minute, or where space is limited, these sealers can be affordable and versatile wrappers within a certain range of product sizes. Available in different seal sizes, the most common limiting factor with L-sealers is product length. 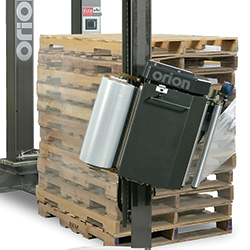 Vertical continuous-motion shrink wrappers are applied to wrap products in the upright position. 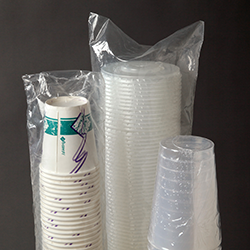 These systems wrap products such as bottles, cans, jars, or canisters into multipacks, directly from a filler process. Multipacks have quickly grown in popularity as manufacturers have found them to be a great way to offer special pricing promotions, or to package different forms of the same item in variety packs. But shrink wrapping multipacks of vertically-oriented containers such as bottles, cans, canisters, jars, boxes and aerosols poses significant challenges for manufacturers. In a conventional multipack shrink wrap set-up for wrapping vertically-oriented products, once the containers are filled, they must then be laid down on their sides on a conveyor and manually turned so that their logos are facing in the same direction and/or their barcodes are hidden. The only practical way to hold the items together to keep them from rolling while being wrapped is to use a chipboard carrier tray or boot. They are then fed through a horizontal shrink wrapper which applies a polymer plastic film, and when heat is applied it shrinks tightly over whatever it is covering. Because the manual manipulation of the products is done off-line, many pharmaceutical manufacturers prefer to send out the individual containers after filling to contract packagers and have them orient the products and shrink wrap them into multipacks. In essence, the manufacturer fills the containers, sometimes wraps them, boxes them, palletizes them, and ships them to a contract packager. The contract packager takes the individual containers out of the boxes and puts them on a conveyor along with a carrier tray, orients the positioning of the containers so the logos and barcodes are in the proper position, and shrink wraps them in multipacks. The contract packager then boxes, palletizes and sends them back to the pharmaceutical manufacturer for distribution or to an external distribution center. This method not only adds additional costs, labor and time to the packaging process, but also necessitates the use of added packaging materials from the carrier trays and film for double wrapping. Add to this the increased consumption of energy for additional transportation and the double wrapping and cartoning, making for a very inefficient system. Pharmaceutical and nutraceutical manufacturers, and contract packagers, have been in need of a way to shrink wrap these vertical-product multipacks without the added labor and expense from conventional horizontal shrink wrapping systems. This has now been realized. The latest technology in vertical shrink wrapping eliminates these problems. 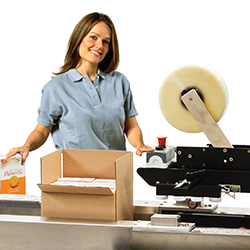 With no need for manual re-orienting of the products prior to wrapping, containers can now go directly from filling to wrapping to cartoning to distribution in-line, without interruption. The latest systems are capable of wrapping 150 three-container multipacks per minute while using a minimum amount of film. Additionally, carrier trays are no longer required to position the individual containers for shrink wrapping with this latest technology. Streamlining these shrink wrapping systems are innovations in technology that are enabling faster product throughput, with less downtime, less maintenance requirements and more efficient usage of film. One of the latest and most pivotal technologies to impact the performance of automated shrink wrapping is servo orbital-motion sealing head technology. In conventional shrink wrapping systems, a box-motion is performed by the sealing head. This refers to the rectangular-shaped path of the sealing head, in which the device making the end-seal moves horizontally with the product as the seal is being made. When the seal is complete, the head raises and the carriage returns to engage the next package and make the next seal. The box seal executes rapid movements back and forth, and requires a large and heavy carriage assembly to mount the sealer. This creates considerable inertia, requiring significant force to stop the carriage in its forward and backwards motions. Bumpers are typically used to provide hard stops for the sealer carriage, causing shaking that usually occurs on the fast returns, forcing the system to pause while the photo eyes and sensors settle out. Speed of cycle time is compromised with this type of reciprocating motion. Depending on the package size, there are times when the head sealer cannot get back into position in time for the next seal. Servo orbital-motion technology eliminates the need for the sealing head to move horizontally with the product while the seal is being made. The orbital sealing head moves in an ellipse, always in the same direction, eliminating any back and forth motion by the sealing carriage, thereby dramatically increasing the throughput speed of the wrapper. The orbital seal head does not have to come to a complete stop when cycling, which drastically reduces stress on the components. It uses inertia to its advantage instead of fighting against it with every cycle, like with a reciprocating box motion seal head. Servo-control allows the motion of the orbital head to be electronically shaped to create the optimum path for each product, producing great seals, using the minimum amount of film, and cycling at the fastest rate possible. It allows for extremely fast motion while also gently ramping into both the closed and open position at the last moment. This eliminates any bounce during the sealing process. Seal time, temperature, and even seal pressure can be controlled from a touchscreen control panel. The orbital-motion wrapper is outfitted with a product protection system which ensures that the orbital head will not close down on any product. A sensor maps the position of each package as it enters the orbital head operating space, and knows when a package is misplaced, skipping that seal cycle. The entire system is built with Generation 3 servo-technology, meaning that it was designed from the ground up to integrate servo-technology, PLC controls and the mechanical elements of the system. The system’s 10-axis servo-controls provide extremely accurate registration, minimizing the amount of film used for wrapping, and reducing the need for maintenance. However, improvements in horizontal box-motion sealing technology have taken place, as well. A hybrid pneumatic cam system allows very fast movement of the sealing-head carriage back and forth, to seal and separate packages without the harsh stops and starts inherent in conventional horizontal sealing shrink wrapping systems. This allows maximum throughput speeds with long-term reliability and minimum maintenance. Supporting this is a system called Motion Trim technology, which electronically minimizes the motion of the end-seal device. And Versa Seal side-seal technology, which ensures consistent, high-quality seals across a wide range of film types and gauges. Versa Seal provides control of the three elements necessary for a good seal: pressure, temperature and time. With standard auto-spacing control, horizontal as well as vertical photo eyes, and the ability to precisely vary conveyor speeds to relax the film between products, horizontal sealing technology has reached a new level of performance for pharmaceutical manufacturers. This latest technology in shrink wrapping enables a significant leap in performance for those pharmaceutical manufacturers desiring to streamline their packaging lines. Reduced labor, material usage and operating costs, and faster cycle times and higher throughput are the key benefits. This new technology also affords pharmaceutical manufacturers a wide latitude of flexibility to design and set-up shrink packaging lines to custom fit their specific requirements. A capability that can make their product packaging lines a showpiece of efficiency and ROI.